I have a few sourcebooks I go back to when I get stuck in campaign planning. If I'm running a city game, I'll pull down City of Lies, The Kaiin Players Guide or Damnation City. For mysteries, I leaf through one of the Gumshoe books or GURPS Mysteries. If I'm looking for fantasy details, I head to Creatures & Treasures. For supers I look at Villainy Amok. For everything else there's S. John Ross's Big List of RPG Plots (the most useful thing out there). 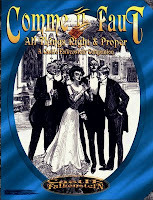 And if I'm thinking about Victoriana, Steampunk or any game with significant social factors I go back to Comme Il Faut (CIF), a supplement for Castle Falkenstien . 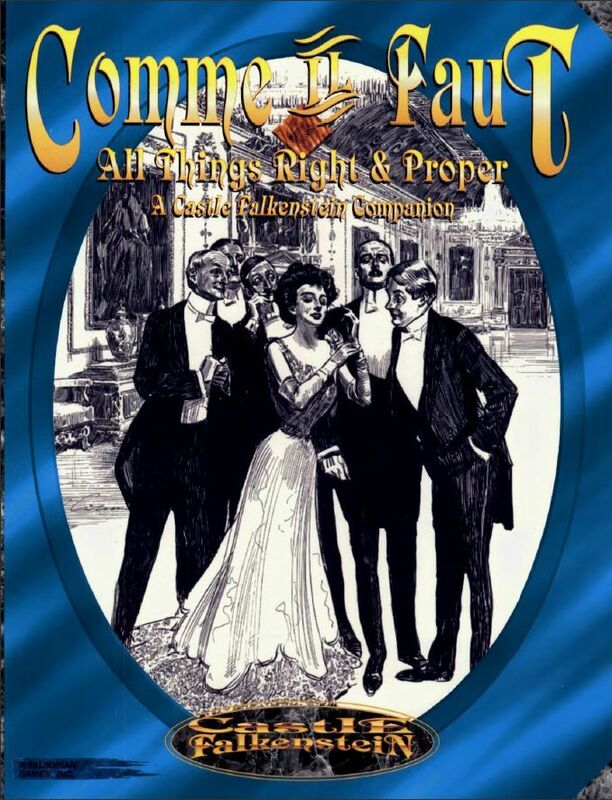 Let me start out with a verdict to make my position absolutely clear: if you bought and enjoyed Falkenstein, Comme Il Faut ought to be your next purchase. It is good, extremely useful and adds a lot to the game. Buy it if you can. So why should non-Castle Falkenstein gamers buy this? There's a lot here to like and to bring over into other games- and not only Steampunk and Victorian ones. Comme Il Faut, All Things Right and Proper describes itself as "A Castle Falkenstein Companion." The book itself is 128 pages, nicely laid out. It does suffer in spots from the strange switching of font sizes from section to section characteristic to these Falkenstien books. As opposed to original artwork, CIF uses the art of Charles Dana Gibson which looks great. The consistency to the period art period really fits the books . Oddly R. Talsorian went with blue ink for the text, which isn't bad on the page but might be more problematic on screen working from a pdf. Overall it is physically a nice product. The first half of the book, up to page 68, offers an overview of the world and society for New Europa and the Victorian period it emulates. Each topic gets at least a page and in some cases more- often complimented by boxed text for details (prices, distances etc). It begins with a discussion of behavior, dress, and a typical day's activities. Next, assignations, parties, country weekends, duels, education, fashion, the help, and gossip. There's a great breakdown of the likely topics of news and gossip by year. Then there's still more covering clubs, money, novels, travel, holidays, royalty, calling on someone...it goes on and on, ending (appropriately enough) with a page on Zeitgeist. CIF does a good job of reminding the reader from time to time of the details of the setting. For example, there's a page on Fairie etiquette. However author plays these notes lightly. If you're looking for a general sourcebook on the period, those asides don't get in the way. The basic ideas of the period can be applied elsewhere. If you're a Falkenstein gamer, you'll be pleased to recognize the nod given to the fantastic elements. To be blunt the material here is dynamite. I've read other games and their distillation of these ideas (GURPS Steampunk, The Imperial Age, etc). Comme Il Faut does the best job of making those ideas easy to get at and useful. It is neither too brief, nor too in-depth. It does a better job than many other pseudo-historical game supplements. I've read some which felt simply lifted from real world sources with a few names and details changed. (In fact more than once I've been stopped cold reading a history books when I hit paragraphs a game book had simply cut and pasted without attribution). CIF maintains a solid, enjoyable and consistent voice. There's almost nothing in the way of stats here- making it easily useful for other games. I go back and reread this section of Comme Il Faut from time to time, not just for games about that period. CIF's presentation of daily life and society gets me to thinking about how those issues and details appear in other worlds. How is dress handled? What are the codes for social behavior? What represents leisure? What are the events of society? That makes this an excellent idea book- a great place to start for world building and development. On this section alone I would recommend it. The second half of the book deals with matters more Falkenstein-ian. Here we're treated to a variety of FAQs, new rules, and optional mechanics. There's something more than a little quaint about an in-book FAQ these days; Comme Il Faut came out in 1995, before the Internet kicked into high gear and universality. The questions to clarify some basic issues mostly about the order and details of resolving tasks. CIF then offers eight new skills and three new roles. The former hit the right note, the latter seem a little unnecessary since you can build those roles on your own. Past those expansions and additions, the section offers some interesting variants on the card-basis for Falkenstein. You get a short but interesting section on using the cards to mock up a tarot and to generate random personalities. This is followed by a version of the damage and feat system which reduces the (albeit small) number crunching of the original rules further. That's complimented by the reverse approach- a highly detailed list of firearms for the period with stats and a set of rules applying hard numbers to actions in the game. I've mentioned before how evocative the Castle Falkenstein magic system is. It is rich, freeform and yet the simple mechanics and limitations make it feel right for the setting. CIF spends eleven pages looking at those systems. About half those pages answer questions and offer advice to Hosts trying to manage player character wizards. In a nod to other games, it offers a list of classic FRP spells and the elements involved. Most usefully it provides some solid and concrete advice for handling Harmonics at the table- a tool for the Host to keep magic unique and dangerous. Everything here helps make one of the few obscure parts of the original Castle Falkenstein work smoothly. Lastly the section ends with a significant chunk dedicated to classic frames for Falkenstein and alternate approaches. A lengthy piece talks about how to approach task resolution without a randomizer- how to effectively go "diceless" in the game. Comme Il Faut looks at each ability and what would be reasonably possible at what rank. While only a few pages, the material's fairly exhaustive and useful for GMs uncertain about how to arbitrate an abstract system. Those diceless ideas play into the section on Live Action Falkenstein- a set of rules ahead of their time given the more recent penchant for Steampunk costuming. The last dozen+ pages of the book offer discussion of various campaign frames (horror, mystery, romance, etc), a timeline of the period, and nice full page maps of several cities. I came out of the gate saying I thought this was a great product. I would recommend it as a first purchase for any Castle Falkenstein player. It lacks the narrative devices of other books (like the core book and Book of Sigils) but more than makes up for it in utility. As I suggested earlier Comme Il Faut would be useful to any Steampunk or Victorian game...but up to a point. The first half is universal, the second hald less so. If you add in the general discussion of campaign themes, you end up with about 80 of 128 pages being portable, and the rest being highly tied to the mechanics of the specific game. That may put some people off, but I would at least recommend purchasing the pdf to genre enthusiasts. One of my favorite supplements for any RPG system. Great review! Falkenstein's freeform magic was brilliant, and it advanced the state of the art, but I dislike the print layout of Comme Il Faut. I found it less than perfectly legible. The ideas in Comme Il Faut are still inspiring after all these years, but I want a large print version. 2- I'm going to have to write prototype versions of such things for many iterations before they are decent.